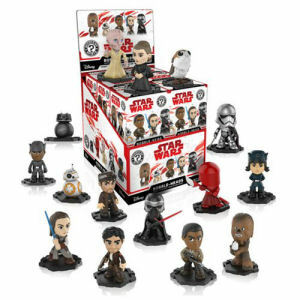 We have Just Sold out of Star Wars The Last Jedi Mystery Mini Bobble Head Master Carton. This Item is unavailable at present. From the Star Wars The Last Jedi collection by Funko. Star Wars The Last Jedi Mystery Mini Bobble Head Master Carton. Case contains 72 individually blind packaged mini-figures. Rey - Leia - Chewbacca - Kylo Ren - Rose - Porg - BB-8 and others. Measure 2.5 inches tall. Item selection is random. Items are in blind packaging. We cannot accept requests for specific items. We do not accept returns on opened items. You will receive duplicates.